Balanced Scorecard (BSC) Rapid Prototyping Toolkit allows you to implement a BSC management system within your organization in days, instead of weeks or months. It includes a proven framework for BSC rapid prototyping, along with associated tools, templates, and educational resources (listed below). There is lack of consensus as to what a "balanced scorecard" is. To complicate matters, many organization initially start with developing a BSC without first developing its companion and arguably more important Strategy Map from which the BSC's Key Performance Indicators (KPIs) should be derived. A BSC is a feedback mechanism. The real intelligence like a GPS in a car come from a strategy map. Further complicating matters is organizations confuse strategic KPIs that belong in a scorecard from operational performance indicators (PIs) that belong in a dashboard. This Strategy Map and Balanced Scorecard framework provides instructions on how to initially construct both instruments in a single day. 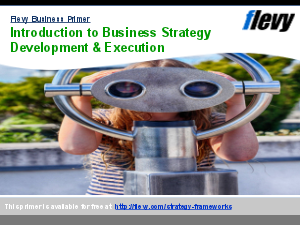 The documents in this Flevy business framework enable an effective and successful implementation method for a Strategy Map and its associated BSC. This method assures achieving a permanent, repeatable, and reliable BSC in days, not many weeks and months. The purpose of this approach is to accelerate learning for the managers, remove misconceptions, and gain buy-in from managers and executives for applying the BSC to align the priorities and behavior of managers and employee teams with the executive team's strategy. A reason this method works is because it is engaging. The organization is designing the strategy map for their own organization, not of a fictitious organization. The managers relate to the strategic objectives formulated by the executive team. They are of their own company. People learn faster by doing. This "quick start" approach starts with one day workshop with roughly 5-7 senior executives. This initial strategy map and its BSC is deliberately named BSC #0 because its purpose is not to provide usable information. That comes next. The next "iteration" is BSC #1, which will be more refined. Documents 2-5 are included in the secondary ZIP. Balanced Scorecard? Channel Distribution Strategy Example? Lean? Or something else.